You're in the RIGHT PLACE!" Learning Spanish In The Process! Learn how to speak clearly to your Spanish speaking clients immediately! Take a multi-media, practical, fun course specific to your profession! Receive 12 hours ACPE continuing education credit. Make yourself a more valuable employee and increase your marketability. Take the course at your Convenience ...anytime online! If you have a busy lifestyle, this course is for you! Claim Your FREE Pharmacy Spanish Videos! Fill out the form below to preview the Pharmacy Spanish course (or to enroll right away) and you'll immediately receive two FREE Videos. 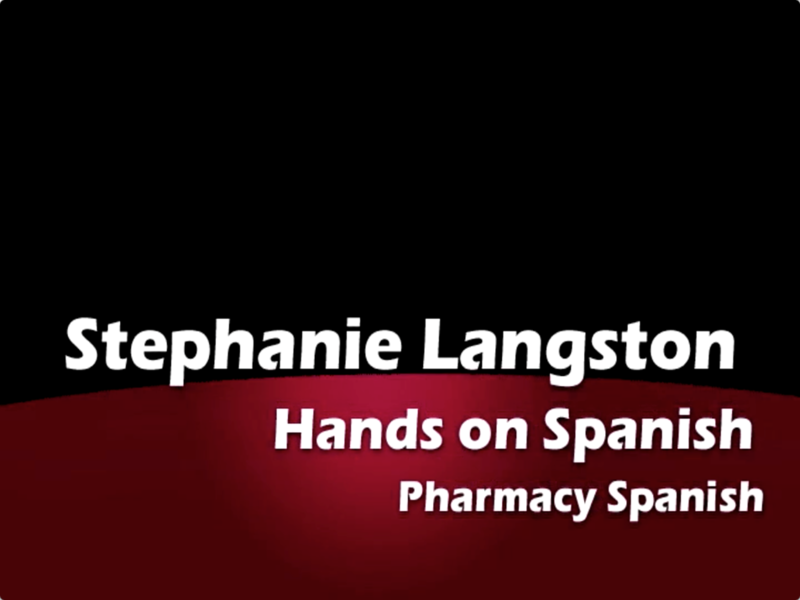 Video 1 is the Pharmacy Spanish Course Overview. Video 2 shows the Top 7 Pronunciation Errors Made By English Speakers Learning Spanish! Your Email Address is secure with us, We HATE Spam too! The University of Georgia College of Pharmacy is accredited by the Accreditation Council for Pharmacy Education as a provider of continuing pharmacy education. This activity is intended for pharmacists and pharmacy technicians who wish to develop or improve their Spanish-speaking skills and provide culturally appropriate care for Spanish-speaking patients. with active learning and assessment. given three attempts to successfully achieve a score of 70% or better on each assessment. the University of Georgia's College of Pharmacy continuing education website (www.rxugace.com). completion of the activity evaluation and may be accessed on your profile at NABP.net. 1. Describe culturally appropriate methods for communicating with Spanish speaking patients and their families. 2. Greet a Spanish-speaking patient and ask basic questions. 3. Communicate with Spanish speaking patients in complete sentences. 4. Correctly pronounce any word in Spanish, including prescription and over-the-counter medications. 5. Discuss symptoms, medical conditions, and insurance. 6. Inform patients of prescription status and communicate problems with refills. 7. Obtain personal information such as name, address, date of birth, drug allergies and current medications. 8. Give accurate directions for use including warnings of side effects and drug interactions. 9. Counsel the patient/caregiver on appropriate use of medication using open ended sentences. President and Curriculum Director of Hands on Spanish, Inc. Copyright © 2000 - Hands on Spanish All rights reserved.